This cream helps keep your hair soft and lustrous, and cares for damaged portions of hair from the inside out. Though it is common knowledge that protecting one’s skin from ultraviolet rays is important, many people may not know that ultraviolet rays can damage hair as well. If you will be spending time outside, whether in the summer or the winter, it is advisable to use a product such as Purelady’s Hair repair cream in order to help prevent some of this damage. Our Hair repair cream does three jobs: Its beauty ingredients will soak into your hair and help care for any portions that have been damaged. At the same time, the cream’s plant oils, plant extracts, and other ingredients will moisturize your hair and protect it from ultraviolet rays. And, as the cream is maintenancing your hair, you can also use it for styling purposes! This cream’s multifunctionality and its compact tube design make it an economical item to keep handy in any bathroom cabinet or travel kit! Dispense an optimal quantity of the cream and massage it in evenly all throughout your hair. 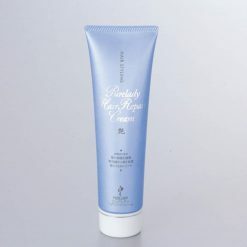 Adjust the quantity of cream you use according to the length and density of your hair and how you want it to be styled.This cream can be used on completely dry hair, or on hair that has been recently washed and then towel dried.This cream does not need to be rinsed out after application. This product contains water, diglycerin, cyclomethicone, alcohol denat., limnanthes alba (meadowfoam) seed oil, butyrospermum parkii (shea) butter, simmondsia chinensis (jojoba) seed oil, citrus aurantium amara (bitter orange) peel oil, carboxymethyl chitin, hydrolyzed silk, arnica extract, hypericum erectum extract, chamomilla recutita (matricaria) extract, Japanese linden extract, equisetum arvense extract, achillea millefolium extract, salvia officinalis (sage) extract, malva sylvestris (mallow) extract, calendula officinalis extract, brown algae extract, aesculus hippocastanum (horse chestnut) extract, cholesteryl/octyldodecyl lauroyl glutamate, tocopherol, butylene glycol, polyacrylamide, hydrogenated polyisobutene, dimethicone, laureth-7, phenoxyethanol..